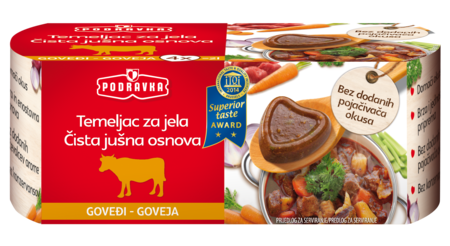 Podravka bouillons will change fundamentally your attitude towards food preparation. No added flavour enhancers, no artificial aromas, totally natural beef taste - enjoy delicious dishes with not too much time spent in the kitchen! Simple preparation, prior to usage dissolve bouillon in water or directly add to the dish. One container of bouillon is sufficient for about 500 ml of dish. Every packaging contains 4 containers of bouillon and a tried and tasted recipe which can be found on the inside of the packaging. You are given the basis, now you can enjoy the experience of your own culinary upgrading! To improve flavour of various dishes (stews, sauces, risotto, stewed dishes with meat, etc) - add bouillon in the dish. One container is sufficient for 500 ml of dish. Add salt at your choice. For preparing soups - put the content in 500 ml of boiling water and simmer... show more To improve flavour of various dishes (stews, sauces, risotto, stewed dishes with meat, etc) - add bouillon in the dish. One container is sufficient for 500 ml of dish. Add salt at your choice. For preparing soups - put the content in 500 ml of boiling water and simmer for about 2-3 minutes. water, salt, maltodextrin, palm oil, sugar, inulin, yeast extract, natural aromas, dried beef extract 1,5%, dried carrot, thickeners (xantan gum, caruba gum), spices, dried celery, dried onion, colour (ordinary caramel), dried parsley leaf, corn starch. May contain wheat flour, milk and eggs in traces. Storage: in a dry place at room temperature. After opening, keep in refrigerator up to 3 days. Product can crystallize - crystallization is a natrual proces and does not effect the quality.